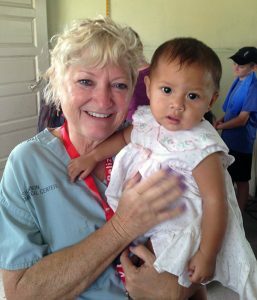 Our most recent issue of ACU Today magazine features alumni who serve as medical missionaries, committing their time, energy and other resources to bring healing and the Gospel to those in need. 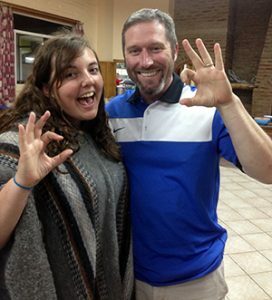 We asked other Wildcats to share their favorite #ACUmissions photos and stories as well. 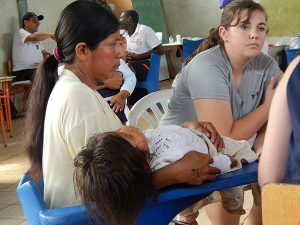 I go with the North Belize Medical Mission, overseen by the Central Church of Christ in Bryan, Texas. I thought the first mission trip was a “one-time thing,” completely out of character for me, but God had a different idea, and I have been a team member for 18 of the 21 years the mission has been going. At various times, all of my children and my husband, Bryan (’76), have also gone. My daughter is Hayley (Horner ’04) Rodgers; my sons are Beau Horner and Brady Horner, who is the youth minister at Westgate Church of Christ in Abilene. We moved away from Bryan/College Station many years ago, but continued to travel with the team. We set up clinics in four different villages, and our services include dentistry, eyes and glasses, checkups, and prescription and maintenance medications. We do minor surgical procedures and, of course, spiritual service, counseling and local church support. Bob Wolfert is the team leader. My job is translating Spanish for the doctors. English is the official language, but many Belizeans speak only Spanish. A few speak a form of Deutsch (there are Mennonite villages), and many of the much older residents speak Mayan. So it is never boring! 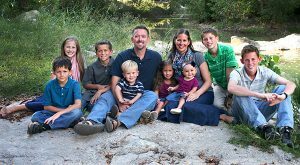 Dr. Jeff and Amy McKissick with their children (from left) Micah, 8; Ginny, 14; Tyler, 10; Josiah, 2; Julia, 3; Claire, 1; Joshua, 12; and Ryan, 16. I graduated from ACU in 1997 and my wife, formerly Amy Crittenden, R.N., attended ACU from 1995-98. We have been working in Paraguay, South America, as full-time medical missionaries since 2005. I am a family physician, and half of our work is free medical care to the poor of our rural community while the other half is church planting in this unreached corner of Paraguay. We work full time with SIM, the same missions organization to which Dr. Kent Brantly (’03) was attached during his time in Liberia. Here are two photos from the medical missions trip I helped with this summer. The first photo is of me translating for one of the nurses. We were in the jungles of Ecuador, up the Cayapas River. The second photo is of me and Dr. Scott Bedichek (’99), an ACU alumnus I met on the trip. He served as our dentist. My job was to translate for the nurses, and it was an amazing experience. I have wanted to translate on a medical missions trip since my first Spanish class, and after doing a Spanish immersion program in Montevideo through ACU, I was finally able to achieve my dream. Our team had six different medical clinics during our time there, and we treated hundreds of people.